Over five consecutive days, Phil ran 25 kilometres in aid of The Halo Trust, an international charity that aims to rebuild lives in countries like Syria by clearing landmines, unexploded bombs and the deadly debris of war. Phil ran across five locations, including two of Morris Site Machinery’s sites; Gosberton in Lincolnshire, where his route was mapped out by over £1 million worth of Morris Site Machinery’s lighting towers, and Four Ashes in Wolverhampton, which saw Phil run 5k around the industrial estate. 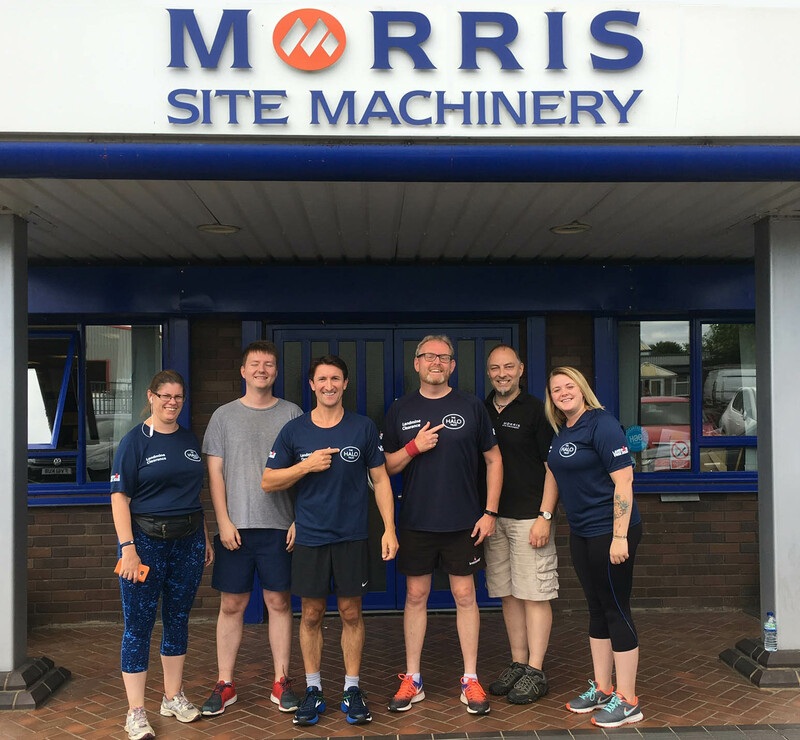 By midweek, Phil was joined by members of Morris Property, Finance, HR and Marketing, all from Morris and Company’s Head Office in Shrewsbury, who spelt out a human ‘HALO’ in The Quarry, the town’s local beauty spot, before they set off on their 5k. Phil then went on to run at two more locations with family and friends at locations close to his heart. Through his JustGiving page, Phil has so far managed to raise £855.00 (not including Gift Aid) and the total is still on the rise. This year’s charity was chosen partly because of the name it shares with the new lighting range released by Morris Site Machinery. The Halo is an innovative new anti-glare lamp head that delivers 360 degrees of diffused light from its four 300W LED quadrants. The Halo lights can be fitted to any engine powered SMC lighting tower, including the TL90 and the TL60. Morris Site Machinery supplies companies across the UK with safe and reliable equipment and top level after care service. For more information on Morris Site Machinery’s wide range of lighting towers, generators, pumps and pressure washers visit http://www.morrismachinery.co.uk or call 0345 409 0280.